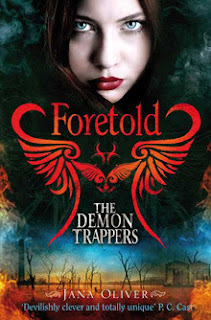 Foretold is the final instalment in the demon trappers series and certainly the best book in the series in my opinion. It was fab to have a series that went out on a high rather than one that dragged out and wasn't as good. I won't say too much about this book as I don't know how to without giving too many spoilers away but I will say that I thought it was a very satisfying ending for the fans who have loved this series since book one. Riley is her usual brilliant self and a cracking heroine. I love her strength and her wit but also the fact that underneath it all she is as soft as they come and has a heart of good. I loved that you really get under the skin of Beck much more in the book and I loved every scene with him in. All in all a perfect way to end the series. I saw this series at Waterstones the other day and I wasn't sure if it was a good series. I'll give it a try after all.